In recent years, the ethics of dental practitioners have received increasing attention from the public. As a result, the dental community has proposed ways to enhance public confidence in dental practitioners, including the formation of ethics committees in dental associations and the establishment of a national ethics curriculum for dental students. Although guidance and education can influence ethical decision-making, in this paper, we investigate the hypothesis that competition resulting from the market environment surrounding dentistry could affect the ethical behaviour of dental practitioners. To explore this potential link, we conducted a retrospective study of cases of financially related misconduct committed by dental practitioners in Ontario, Canada's most populated province and largest dental care market. The objective was to observe whether there is a relation between the density of dental practitioners and the occurrence of financially related misconduct. The Pearson coefficient between these two variables was 0.67 (p = 0.17), which indicates a strong correlation. However, this result is inconclusive because other pertinent factors, such as patient demand and patient characteristics, were not considered because of lack of data. Further research on the topic is warranted and future researchers may use our methods when more data become available. In recent years, the ethics of dental practitioners in Canada have received increasing attention from the media.1 Some have argued that the public views dentistry as shifting away from a caring profession to more of a business, where efficiency and profit are the main objectives.2 Even within the dental community, there are conflicting views on whether dentistry should be modeled as a profession or a business.3,4 As a profession, dentistry operates under a social contract to provide optimal oral health care to the public.5 However, in countries such as Canada, where dental services are almost wholly privately financed and delivered,6 this goal cannot be achieved without due consideration of the demands of a business environment. In such an environment, dental practices operate under the same constraints as any private business, i.e., they must be financially sustainable, and they are subject to external market pressures. To cope with increasing competition, dental practitioners may adopt business strategies, such as marketing and advertising, to attract patients or retain their patient base.14 This contributes to the public's perception that dentistry is more business than health profession,15 again bringing the ethics of dental practitioners into question. With increased competition, some may assume that dental practitioners have more incentive to behave unprofessionally for financial gain. Such behaviour includes performing unnecessary procedures or charging excessive fees for services. Concern over the integrity of dental practitioners can be observed in the public opinion surveys conducted by the Canadian Dental Association in 2010 and 2014.16 Both surveys found that Canadians often describe the patient–dentist relationship as transactional. Dental practitioners are considered business people first and health care providers second. The cost of dental services was identified as an issue, and trust and value were of concern to the public. In the 2014 report, only 60% of respondents reported having a positive or very positive view of dental practitioners. To explore the potential link between competition and ethical behaviour, we conducted a retrospective study to analyze cases of financially related misconduct of dental practitioners in Ontario, Canada's most populated province and largest dental care market. The objective was to observe whether there is a relation between the density of dental practitioners and the occurrence of financially related misconduct. For this retrospective, descriptive study, we gathered information on population size, the number of dental practitioners, and the number of reported cases of financially related professional misconduct. We divided Ontario into regions based on Canada Post's 525 Forward Sortation Areas (FSA), designated by the first three characters of the postal code. These were grouped into five major geographic areas, identified by the first letter of the postal code: K, Eastern Ontario; L, Central Ontario; M, Toronto; N, Western Ontario; and P, Northern Ontario. The 2011 Census of Canada18 provided demographic data for Ontario organized by FSA. Population estimates for the FSAs were also obtained from the census. To calculate the number of dental practitioners working in each FSA, we used the member directory of all generalists and specialists in the province published annually by the ODA. We searched an electronic version of the ODA member directory for 2013/201419 to obtain the number of occurrences of each FSA. Because each dental practitioner is listed twice in the directory — once by last name and a second time by the location of the practice — we divided the number of FSAs by 2 to determine the number of dental practitioners in each FSA. The 43 discipline summaries related to different dental practitioners. They were published after the RCDSO had investigated the allegations and concluded that the practitioner had behaved unprofessionally. The practice addresses obtained from the discipline summaries were entered into Canada Post's website to locate the corresponding postal code,21 which was then mapped to the FSAs. We calculated the density of dental practitioners by dividing the number of dental practitioners in each area by the population, and expressed the result as the number of dental practitioners per million population. Assuming all dental practitioners have an equal chance of committing professional misconduct, an area with a greater number of practitioners would result in more cases of misconduct. To compare the prevalence of misconduct between areas, we divided cases of misconduct by the number of dental practitioners for each of the area, expressed as the number of cases of professional misconduct per 1000 practitioners. Finally, we used the Pearson product-moment correlation coefficient to measure the degree of linear correlation between dentist density and the occurrence of financially related misconduct. The Pearson coefficient takes on a value between –1 and +1; the farther the coefficient is from 0, the stronger the correlation between the two variables. It appears that, as the density of dental practitioners increases, the occurrence of misconduct increases correspondingly (Table 1 and Figure 1). Toronto has the highest density of dental practitioners and the highest occurrence of misconduct, whereas Northern Ontario has the lowest density of dental practitioners and the lowest occurrence of misconduct. The Pearson coefficient between the density of dental practitioners and the occurrence of financially related misconduct is 0.67 (p = 0.17), indicating a strong positive correlation between the two variables. Table 1: Distribution of dental practitioners and incidents of financially related misconduct in Ontario. 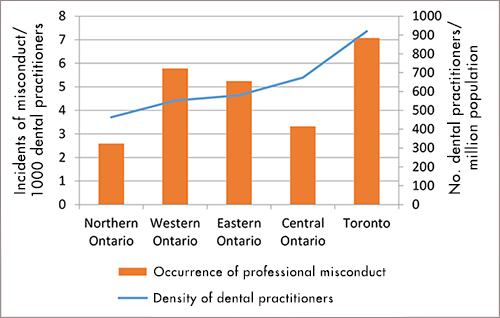 Figure 1: Relation between density of dental practitioners and financially related misconduct in Ontario. Although the results suggest that a correlation between competition and the ethical behaviour of dental practitioners is possible, this result is inconclusive because of the limited sample size and limitations in the modeling of competition and ethical behaviour. In this study, we related competition to the density of dental practitioners. However, this is insufficient as density measures the supply of dental services, but it does not consider patient demand. According to Health Canada, the demand for dental services in the population varies depending on such factors as income level and insurance coverage.22 Thus even if two FSAs had the same density of dental practitioners, competition would be more intense in the lower-income FSA because of lower use of dental services there. Moreover, the density of dental practitioners as calculated may not accurately represent the supply of dental practitioners in an area. The calculation depends on the assumptions that people will always obtain services from a dental practitioner in the same FSA, and a dental practitioner will always be available full time. In reality, patients often cross FSA boundaries to seek dental services. In addition, some dental practitioners may not practise full time, and others may split their availability between multiple practices, possibly located in different FSAs. Thus, it is possible to refine the modeling of competition by taking into account patient demand and the actual availability of dental practitioners, but these data are not readily available. In this study, we related ethical behaviour to the occurrence of documented misconduct. This is also insufficient because the occurrence of misconduct could be affected by patient characteristics that influence the number of complaints. Before submitting a complaint, patients must recognize that they have been mistreated. 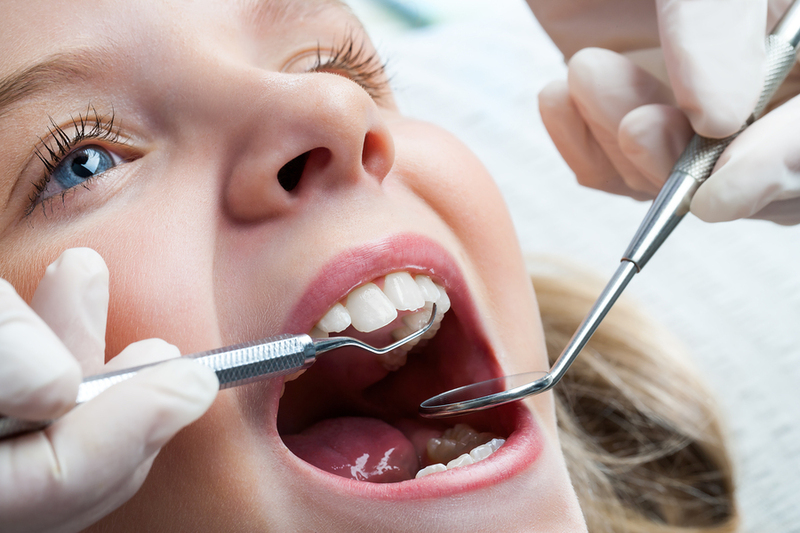 This depends on factors such as patient expectations and the type of dental procedures they received. Even if patients recognize a supposed misconduct, other factors could affect their willingness to submit a complaint. These factors include the availability of dental services in the patient's proximity, the distance to the nearest alternative dentist and whether the patient receives a subsidy for dental services. Data on these factors are not currently available and, hence, could not be included in this study. Another drawback is the underestimation of questionable behaviour. Some such behaviour may not become a complaint because it is not reported; other incidents might be dismissed during an investigation because they are not verifiable. Other complaints that were verified by the RCDSO may not have been included in this study because they were not associated primarily with financial motivation; for instance, cases of misconduct related to substandard treatment were not included. Although some substandard treatment complaints were a result of lack of clinical skills, other cases could be classified as financially motivated. For the sake of increasing production, dental practitioners could rush to complete time-consuming procedures or attempt complex procedures beyond their expertise.23-25 To some extent, this explains why the sample size (i.e., number of cases of financially related professional misconduct) is small in this study. The occurrence of questionable behaviour could be much higher; yet, it is arguably impossible to capture this information. As such, this study could base results only on the occurrence of documented misconduct, which again, arguably, represents unethical behaviours that are detrimental to the public's confidence in the dental profession. To establish a more fulsome account of the putative relation between competition and ethical behaviour, it would be ideal to expand the sample size and perform a multivariate analysis by incorporating the pertinent factors mentioned above. However, this is not possible because of lack of data, in particular information on patient demand and patient characteristics. It is reasonable to assume that competition between dental practitioners is likely to become more intense in the future. On the supply side, the increase in the number of graduates from Canadian dental schools has outpaced that of the general population. As a result, the number of dental practitioners in Ontario has increased from one for every 2277 residents in 2002 to one for every 1992 residents in 2011.10 Others factors, such as delayed retirement and the inflow of internationally trained dental practitioners, also increase the supply of dental services. On the demand side, it is not completely clear whether the need for dental services is expected to rise or fall. With stagnant household incomes and growing household debt, dental care spending may slow or remain constant.10 In the past decade, the United States and Canada have seen an erosion in private insurance coverage among working adults, particularly in the young and those in low-quality employment.7,22 Nevertheless, in Canada, expenditures for dental care (in real dollars) continue to grow year after year.22 In this context, it appears that more research is warranted to determine whether competition plays a role in the ethical decision-making process of dental practitioners. In the literature, studies include empirical data demonstrating that financial incentives affect the quantity of treatment prescribed by physicians.26-27 For instance, physicians tend to prescribe more treatments per patient under a fee-for-service payment structure compared with other payment arrangements (e.g. salaried).26-27 Moreover, studies show a direct correlation between physician–patient ratio and physician-induced demand,28-29 in which the physicians in competitive markets counterbalance the lesser number of patients by increasing the amount of treatment per patient. These studies illustrate the possibility that financial incentives induced by competition can affect the ethical behaviour of health care providers. Considering that financial incentives can also be induced by financial stress, it is reasonable to argue that, if competition can affect ethical behaviour, then financial stress can produce a similar effect. Hence, it is important to consider other factors that influence the financial stress on dental practitioners. For established dentists, financial stress could originate from their households or their dental practices. For younger dentists, financial stress may originate from educational debt. In a survey completed in 2004,30 half of respondents at Canadian dental schools said the cost of dental education was significantly higher than they had anticipated. A third of the respondents indicated that their level of indebtedness would influence their career choice. When respondents were asked to choose one or more career paths, 76.8% chose general dentistry in private practice, which is considered to be one of the most profitable areas of practice. Only 12.2% chose the same option when they were asked to choose again in the context that debt was not a concern. Given that the cost of dental education has risen dramatically over the past decade, the level of indebtedness of future graduates will also increase. Currently, no study has investigated the influence of debt on the ethical behaviour of dental graduates, but our results provide an insight into this relation. If competition is directly correlated with financially related misconduct, then the financial stress induced by increasing educational debt has the potential to increase the occurrence of such misconduct. Based on our results, it is clear that more research is needed to understand ethical decision-making in dental practice. In addition to improving clinical and practice management skills, continuing education for working practitioners can focus further on dealing with such challenges as financial stress and ethical issues in practice. The same focus can also be strengthened in the dental curriculum. Students in dental schools should be prepared to recognize the financial difficulties associated with operating a dental practice in a competitive environment and the incentives and ethical challenges they may face. Mr. Yuen is a third year dental student at the University of Toronto. Schwartz B. Leadership in ethics: where is CDA? J Can Dent Assoc. 2007;73(10):925-7. Esterburg J. Are dentists losing their status as 'professionals'? J Am Dent Assoc. 2011;142(9):1084-5. Welie J. Is dentistry a profession? Part 3. Future challenges. J Can Dent Assoc. 2004;70(10):675-8. Kingsbury D. Is "professionalism" at odds with practice-management education and success. J Can Dent Assoc. 2006;72(9):815-7. Welie JV. Social contract theory as a foundation of the social responsibilities of health professionals. Med Health Care Philos. 2012;15(3):347-55. Marchildon G. Health systems in transition: Canada, vol. 7(3). Copenhagen: World Health Organization Regional Office for Europe on behalf of the European Observatory on Health Systems and Policies; 2005. Vujicic M, Israelson H, Antoon J, Kiesling R, Paumier T, Zust M. A profession in transition. J Am Dent Assoc. 2014;145(2):118-21. Levin RP. Succeeding as a new dentist. J Am Dent Assoc. 2014; 145(3):290-1. Abate R. Preparing for the future of dental care in Ontario. Ontario Dentist. 2014;91(1):18-21. R.K. House & Associates Ltd. Economic report to the dental profession. Toronto: Ontario Dental Association; 2012. Birch S. The identification of supplier-inducement in a fixed price system of health care provision. The case of dentistry in the United Kingdom. J Health Econ. 1988;7(2):129-50. Schaafsma J. A new test for supplier-inducement and application to the Canadian market for dental care. J Health Econ. 1994;13(4):407-31. Levin RP. The reality of competition. J Am Dent Assoc. 2011;142(11):1301-2. Schwartz B. The ethical implications of patient rewards. J Can Dent Assoc. 2006;72(7):631-3. Highlights of the 2014 CDA Annual General Meeting. Ottawa: Canadian Dental Association. Available: www.oasisdiscussions.ca/2014/04/30/agm/ (accessed 2015 May 3). Schwartz B. Dental ethics: Our future lies in education and ethics committees. J Can Dent Assoc. 2004;70(2):85-6. Census of Canada, 2011. Ottawa: Statistics Canada. Available: http://www12.statcan.gc.ca/census-recensement/index-eng.cfm (accessed 2014 Aug 14). Member directory. Toronto: Ontario Dental Association;2013. Discipline summaries. Ottawa: Royal College of Dental Surgeons of Ontario; 2004-2013. Available: www.rcdso.org/PublicProtection/DisciplineSummaries (accessed 2015 Dec 11). Find a postal code. Ottawa: Canada Post; n.d. Available: www.canadapost.ca/cpo/mc/personal/postalcode/fpc.jsf (accessed 2014 Aug 14). Report on the findings of the oral health component of the Canadian Health Measures Survey. 2007-2009. Ottawa: Health Canada. Available: http://publications.gc.ca/collections/collection_2010/sc-hc/H34-221-2010... (accessed 2014 Aug 14). Singh P, Mizrahi E, Korb S. A five-year review of cases appearing before the General Dental Council's Professional Conduct Committee. Br Dent J. 2009;206(4):217-23. Postma TC, van Wyk PJ, Heymans JH, White JG, Prinsloo PM. An analysis of complaints against oral health professionals charged with misconduct at the HPCSA: 2004-2009. SADJ. 2011;66(9):420-2,424-5. Hopcraft M, Sandujat D. An analysis of complaints against Victorian dental care providers 2000-2004. Aust Dent J. 2006;51(4):290-6. Robertson C, Rose S, Kesselheim AS. Effect of financial relationships on the behaviors of health care professionals: a review of the evidence. J Law Med Ethics. 2012;40(3):452-66. Hennig-Schmidt H, Selten R, Wiesen D. How payment systems affect physicians' provision behaviour — an experimental investigation. J Health Econ. 2011;30(4):637-46. Léonard C, Stordeur S, Roberfroid D. Association between physician density and health care consumption: a systematic review of the evidence. Health Policy. 2009;91(2):121-34. Delattre E, Dormont B. Fixed fees and physician-induced demand: a panel data study on French physicians. Health Econ. 2003;12(9):741-54. Walton JN, Matthew IR, Dumaresq C, Sudmant W. The burden of debt for Canadian dental students: part 4. The influence of debt on program and career decisions. J Can Dent Assoc. 2006;72(10):913.